Sennheiser's strongest suit of late has been upper-midrange headphones including the award-winning HD650, at around £300, which are a popular choice with audiophiles and professionals alike, and now Sennheiser have released the HD800 priced at a whopping £1000. It's taken us a while to get hold of a review sample, not least because demand worldwide has so far outstripped Sennheiser's ability to supply, but here we are at last with a pair of these rarified beasts. So what's all the fuss about? First and foremost it's the new driver included in the headphone. A headphone drive unit is typically like a loudspeaker driver in that a flat or slightly conical diaphragm is propelled by a few turns of wire in a magnetic field. In this case, however, the driver diaphragm is actually an annulus, or flat doughnut shape. Sennheiser calls it a 'Ring Driver' and explains that it has a significant advantage over a circular diaphragm, in that it doesn't resonate in the same way at high frequencies. 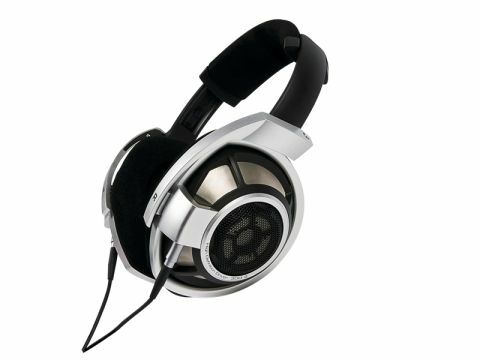 Headphone drivers suffer from the same compromise as loudspeaker ones regarding size. Bigger is better for bass but leads to resonance problems in the treble. The Ring Driver is 56mm in diameter, larger (by a couple of mm) than any other headphone driver in current production, but is claimed to have a much greater resistance to resonance. Sennheiser doesn't go into detail on this, but speaker designers have long understood that the centre of a circular driver is a problem point as energy arrives there from all directions and has nowhere to go: the result is not only resonance but uncontrolled, chaotic, behaviour that can have nasty effects on audio. Dealing with this is a black art in both headphone and speaker (especially dome tweeter) design. Having neatly sidestepped that issue, Sennheiser has employed various measures to ensure that nothing else in the HD800's design lets the performance down. Construction is based on high-performance plastics which we would have sworn were metal, but no – metals would have been too inclined to resonate and colour the sound, so ultra-hard polymers were used instead. Cabling uses four cores of high-purity copper with Teflon insulation and the outer insulation and braiding of the cable have been carefully chosen to minimise mechanical noise-coupling up the wire. Even the headband has been designed against resonance, using both metal and plastics, well-padded, of course, for comfort. The ear cups are also luxuriously padded and every part of the HD800 is designed to resist resonance and rattling. There's one more feature that deserves mention. The Ring Driver, with its large size, produces a good approach to a planar wavefront which seems to the ear to have travelled from afar, aiding sound naturalness. Sennheiser has angled the driver so that the sound appears to come from slightly in front of the head. The precise acoustics of headphone coupling is a tricky subject, but this is an ingenious approach to ensuring a flat and realistic frequency balance. We've had plenty of exposure to high-grade headphones over the last couple of years, so expectations were high for this newcomer. We were not in any sense disappointed, for this is certainly one of the most revealing bits of audio kit it has been our pleasure to encounter. Like a lot of really fine gear, it's not 'impressive' on first listen, but it doesn't take long to realise that something rather special is going on in the neighbourhood of one's ears. If you're not a regular headphone user, you may not be familiar with the advantages of good 'cans'. Viewing them as second-best to loudspeakers has some justification – no headphone will ever whack your whole body like good speakers can, imaging takes a little getting used to and it's a rather solitary experience. But very few loudspeaker designs on the planet can come even close to the level of detail resolution that headphones like these can provide. The first impression of this model is likely to be of a very slightly 'soft' sound – not in the sense of 'not loud' but soft in presentation. To put it rather coarsely, the sound does not stab you in the ear the way some cheap headphones can seem to do. Any idea that the balance is treble-shy, however, will very quickly be corrected. In fact the treble is both lively and rich, but it is so clean that its sheer quality needs a little adjustment time. This quality is at its most apparent when textures are thick but include lots of treble detail, or conversely when subtle high-frequency instruments are playing, such as those various little dangly bits of metal whose names only professional percussionists know. Listen to sounds like that and the chances are you will suddenly think, as we did, 'Damn, regular hi-fi is just so coloured'. It's not just the treble. Midrange is amazingly detailed. Voices and instruments all have exactly the timbre that they do in real life and they don't interfere with each other the way they can when played via less exalted reproduction equipment. A single flute at the back of an orchestra is just as clear as two dozen violins at the front, just like real life. Of course if the recordings you listen to are below par you'll get the proverbial warts and all, but even that's not so bad: the HD800 is ruthlessly revealing, but somehow still seems to make the best of whatever redeeming features a recording possesses. We praised the Grado GS1000 (now superseded by the GS1000i) to the skies as the highest quality transducer we knew of. But we now believe its mantle has now passed to the HD800.